3.06 final drive swap - game changer! shorter Ratio = unleash the soul of Hp/Tq..
What did your theoretical top speed drop to? How does one tune the TCU? Is it like there are only a few specialists that can work the black magic in there or? It’s that easy huh.... got me very tempted. Just one question, by changing final drive are any other components at risk due to the increased power? Please someone help me understand what this does mechanically. What this would change is how much torque gets put to the pavement. This would be greatest in first gear and would decrease in each of the subsequent gears. Therefore, the greatest stress would likely be from a hard launch. Now given the fact that we already easily break traction on street tires when launching, the actual torque put to the pavement at launch wouldn't change. The big increase in stress would be if you did this in conjunction with drag radials that hook up during a hard launch. In this case, the additional torque to the pavement from the new gearing would be "felt" by everything downstream from the differential. Basically the axles. 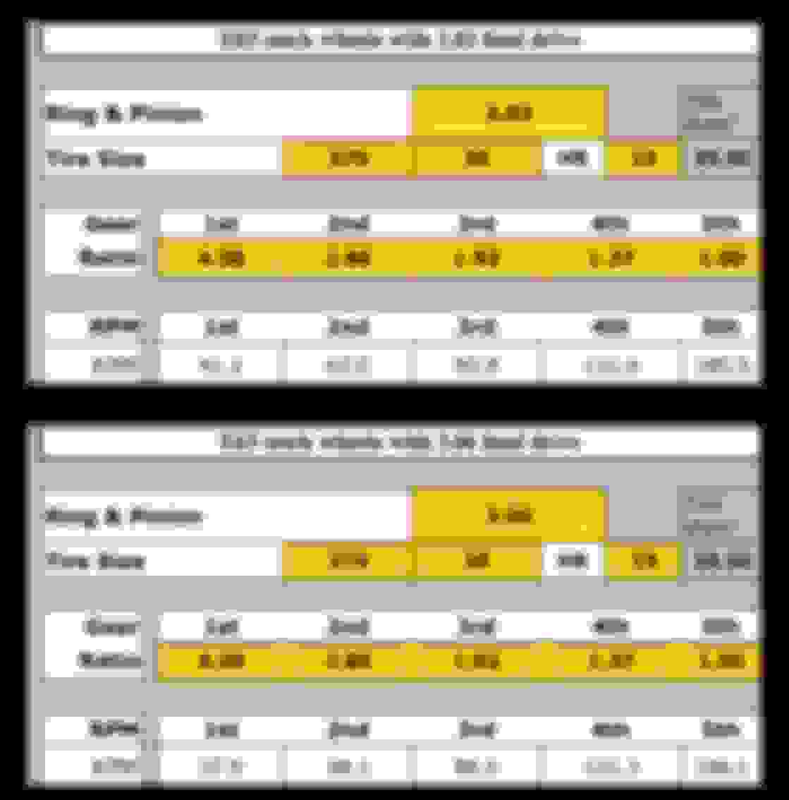 Long story short, I don't expect anything would be much worse off mechanically on street tires, but use caution with drag radials. Your tires will burn up quicker if you spin them more. Oh, and your cruising RPMS in 7th gear will go up a bit, so some negligible increases in wear and tear (I wouldn't be concerned about that), and lower highway mpg. Last edited by BalanBro; 05-23-2018 at 01:57 PM. and of course, that depends to everyone's driving style.. Final drive is in the rear differential, but yes. I did a quick calculation using an online gearing calculator - there's loads of these online. I've only got 1st to 5th here, but it'll give you an idea at the stock rev limit bud. I got my gear ratios online for the "722.9 MCT" via a google search...apologies in advance if these are incorrect. I think I already asked him this, but I can double-check with him - I'll shout you when I get the answer. I also already asked if he can do anything else, but he declined and said it's too much of a minefield to get involved with and due to the TCU being a PITA to get in and out, he'd rather he didn't get involved with things like this. If we can confirm the Canadian spec 63 has the 3.06 we might be able to just plug in a TCU from a Canadian spec car. So i've called Eurocharged and Weistec neither one is willing to code the TCU. I called Bren Tuning they asked that I send an email so the tuner can take a look and see if what I want to do is something he can handle. Does anyone know of a shop in the USA that is willing to do this? I just came back from a night drive and it's friggin awesome man. The sad truth of it is that my car is currently probably not that much quicker than a strong FBO C63, but I know where it has come from and it has come on miles from when it was stock. Awesome results, Thanks for sharing..
Quick Reply: 3.06 final drive swap - game changer!